What Makes Up a Full Irish Breakfast? One thing Britain and Ireland are known for is their hearty breakfasts. There are common ingredients between the two countries' early morning feasts, but there are also dishes that are specifically Irish. The full Irish breakfast was created for farm workers so they would be satiated and ready for a full day's work. The meal was made up of local produce and homemade items, all of which were cooked in a frying pan with a pad of Irish butter. Today the list of foods that make up a full Irish (as it is called) has expanded, and it may not be eaten at the start of a busy workday, but the tradition continues. 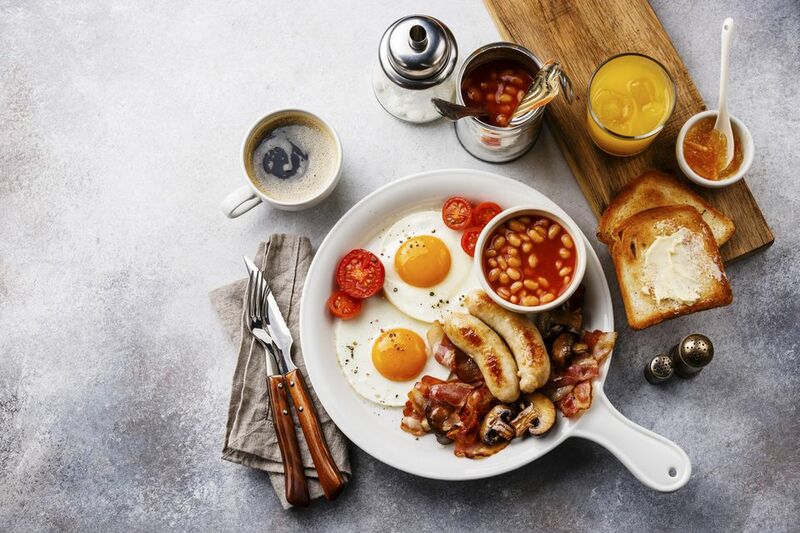 All full Irish breakfasts include some or all of the following: Bacon, sausages, baked beans, eggs, mushrooms, grilled tomatoes, and perhaps some cooked leftover potatoes made into a hash or a bubble and squeak. There will also be toast, butter, marmalade, and lots of tea to drink. What distinguishes this from a full British breakfast is the inclusion of black or white pudding, which is also known as drisheen. The bread served will also often be Irish soda bread to differentiate it from a full British breakfast. And, you may also find fried potato farl (quadrant-shaped flatbread) or boxty (Irish potato pancake) as an alternative to brown soda bread. A full Irish is usually served at breakfast time, but it is also popular at other times of the day, sometimes to replace lunch. Rarely is it served every day of the week, saved instead for the weekend to enjoy on a lazy Saturday or Sunday, or while on vacation in hotels and bed and breakfasts where no stay would be complete without one. The beverages served with a full Irish breakfast are tea and orange juice. Tea has long been considered the drink of the English with belief that the English drink more tea than anyone else. Well, that is actually not true—it is the Irish who drink more tea; the second most in the world after Turkey. So guess what they drink for breakfast? Tea of course, and although it is in fashion to drink coffee, tea still rules. Over the years more foods have become interchangeable as part of a full breakfast in both Ireland and Britain. Some items you may see offered are eggy bread, crumpets, kippers, jolly boys (pancakes), onions (fried or rings) corned beef hash, deviled kidneys, kedgeree, omelette, fried bread, Derbyshire oatcakes, English muffins, potato scones/tattie scones, Arbroath smokies, bannocks, butteries/rowies (lard-based bread roll), herring, haggis, Lorne (square Scottish) sausage, white pudding, laver bread, Penclawdd cockles, Glamorgan (vegetarian) sausage, Crempog (Welsh pancakes), and wheaten bread.